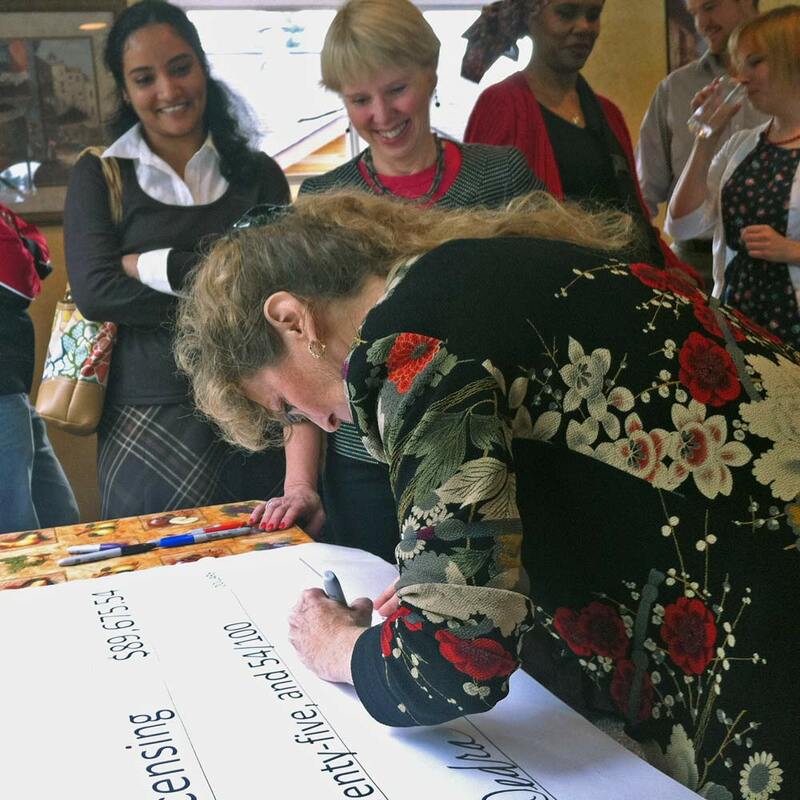 DOL director Liz Luce, top center, looks on as Dr. Dedra Buchwald signs a check to fund a partnership with DOL. Buchwald leads the UW Twin Registry. Identical twins serve as excellent control groups: when one is affected by a disease, researchers can uniquely look at environment and genes for the reasons behind the illness. For researchers, the hardest part of the work can be identifying the twins and getting them to participate in research studies. Thanks in part to a unique arrangement with the Department of Licensing, the UW’s Twin Registry is becoming a one-of-a-kind program in the nation, with the goal of 10,000 twin pair participants. Researchers expect this energized program to deliver significant science and health benefits. DOL provided the UW with an excellent data source since the agency issues driver license numbers based on applicants’ names and dates of birth, and because DOL historically asked initial applicants if they were a twin to combat issuing duplicate license numbers. In 1998, the University of Washington negotiated with DOL to obtain access to agency records as a part of state agency data-sharing. This was necessary to form a twin registry. In early October, 2010, DOL amended its agreement to also collect data about twin-status during driver license and ID card renewals in addition to initial applications. This has dramatically increased voluntary participation in the UW’s Twin Registry. Using federal stimulus funding, the UW funded the reprogramming on DOL servers and other associated processes used in gathering information from the public. “Even during these tough economic times, it’s important that work critical to people’s health and lives moves forward, and it’s equally as important that in these tough times, that we all work together, and that’s what is happening here,” DOL director Liz Luce said. UW researchers say that genetic research performed through this registry could offer new strategies for investigating and treating common and emerging diseases as well as bioterror threats. Due to state budget cuts, some Department of Licensing offices will be closed for business on Monday, October 11, and some will be closed on Tuesday, October 12, as employees take the fourth required temporary layoff day. Licensing offices that are normally open Monday through Friday will be closed on October 11, and offices that are normally open Tuesday through Saturday will be closed on October 12. DOL headquarter operations, including the customer service center, will be closed October 11. The agency is advising individuals who need driver license services to try to take advantage of online service options or to plan carefully to minimize their wait if they have to visit an office in person. You can read more about this closure in a DOL press release issued Oct. 5, 2010 . You are currently browsing the Licensing Express blog archives for October, 2010.